Gen Z mothers are super-multi-taskers. Marketing to busy mothers who are multi-taskers has always been a behavior that influenced the media decisions of marketers, but the “can do” moms of Generation Z are on another level. As technology natives who aren’t afraid of using applications, artificial intelligence, and social friends to help them juggle life, Gen Z moms know how to get things done and often all at once. The products they choose must fit into their time-saving eco-system of tools. Gen Z moms use their skills with filters to shift through your marketing messages. They’ve been using photo filters since they were teenagers to express their emotions to friends. As mothers, they use mental filters to quickly shift through the hundreds of marketing messages they see each day. They can cruise through emails, social media ads, and blog posts as quickly as they can scroll through their Instagram feed looking for relevant and authentic content. Marketers will have to deliver worthwhile content that goes deep with information in order to connect with these moms. Generation Z mothers want to buck the social norms of parenting but gain the approval of friends and followers. Call this the curse of the entire Gen Z population- they seek to stand out by exhibiting their individuality, yet they use “likes” as their personal KPI’s. Products that can be customized to a family’s lifestyle or repurposed with personal tastes will find their way into the Gen Z mom’s shopping cart. The Gen Z mom understands and acknowledges that life, and particularly, motherhood, is difficult. This is a mark left by her own Gen X mother. The latter generation represented the largest number of single moms by choice in history. Not only did the Gen Z mom watch her mother juggle a household as a single mother, but she also witnessed how the 2008 financial crisis impacted her family. She recognizes that life can be difficult and that she may have to work hard to meet her personal goals. Generation Z moms will demand that brands curate more relevant content to maintain her interest. She can sift through content quickly, which allows her to dig deep into the subjects that matter to her most. The Gen Z mom is a digital navigator of content, and she knows if your brand doesn’t have the answers, someone else will. Brands like HP, who have created content sites like MyPrintly.com, will be able to connect with Gen Z Moms because they offer her relevant content. Now is a good time to begin to build your library of videos and other branded content. 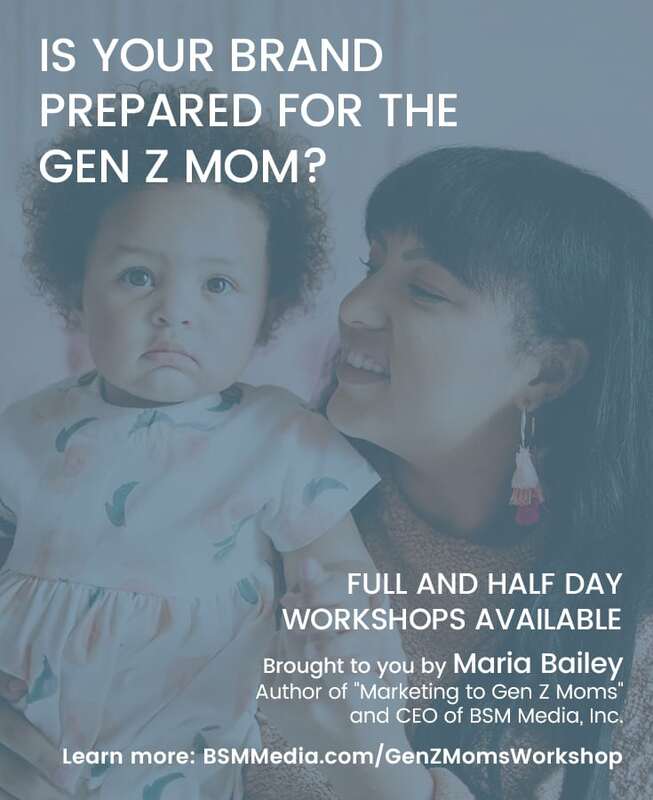 Maria Bailey is available for full or half-day workshops to help your brand prepare for Gen Z moms. Click here for more information!